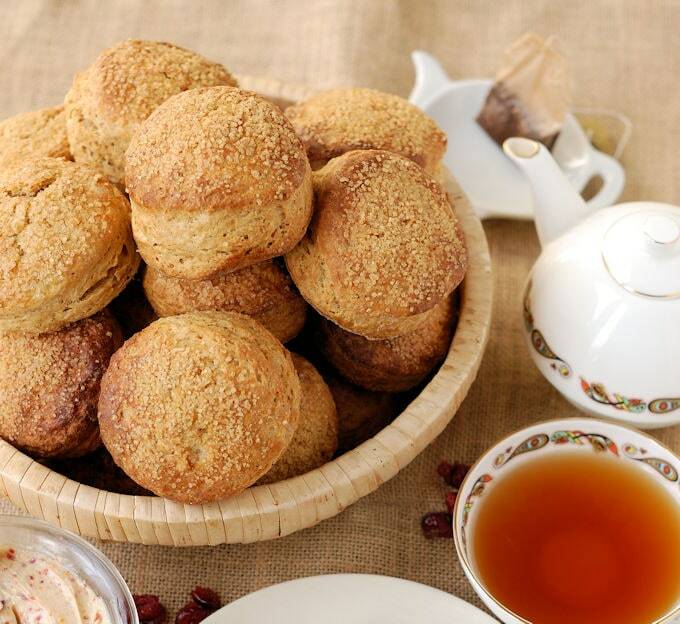 Traditional buttermilk scones flavored with ginger and molasses for a special seasonal treat. 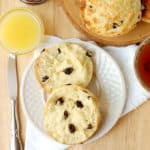 These scones are great for breakfast, brunch or tea-time. I worked in a British tea shop for a number of years and baked hundreds of scones every week. The owner’s mom had been baking the scones but was moving back to Britain, so I was hired to take over. A few months later, when the mom was visiting, she stopped in the shop for a cup of tea and told me my scones were just right, that I “had the touch”. I took that as the only seal of approval I needed. I have to admit that I see lots of bad scones in coffee shops and bake shops. 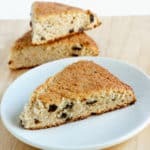 Most of the time they’re so light and sweet they’re closer to a muffin than a scone. 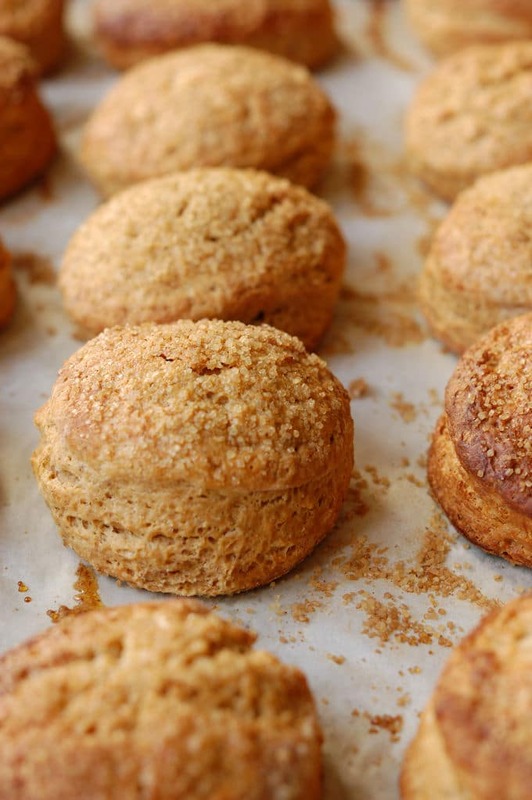 To my taste, a good scone should neither be too biscuit-like nor too muffin-like. I also don’t like scones too rich or sweet since I like to top them with a little clotted cream, curd or butter. The inspiration for this recipe was simply the upcoming holiday season. I love gingerbread so I swapped out some of the sugar for molasses and added ginger, cloves and cinnamon for spiced flavor. 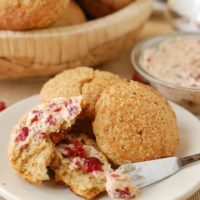 To accentuate the flavors I made a super-easy cranberry maple butter. There are a few things to keep in mind when making scones. First, do not over-mix the dough. After adding the wet ingredients mix the dough until it’s just barely combined, then finish kneading in any loose flour by hand. Second, I use my hands to flatten the dough into a disc rather than using a rolling pin. The dough is so soft this is easy to do. Make sure to keep your hands and the dough lightly floured. 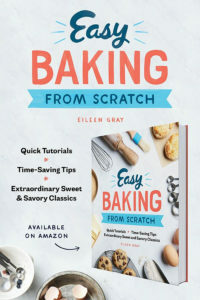 Finally, and this trick also works for biscuits, when you cut the scones push the cutter straight down without twisting or turning. This will help the scones rise up straight and tall. I always finish the scones with a little coarse sugar for a nice crunch. 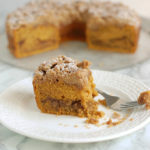 For this recipe I made a ginger-sugar for an added hit of spice. 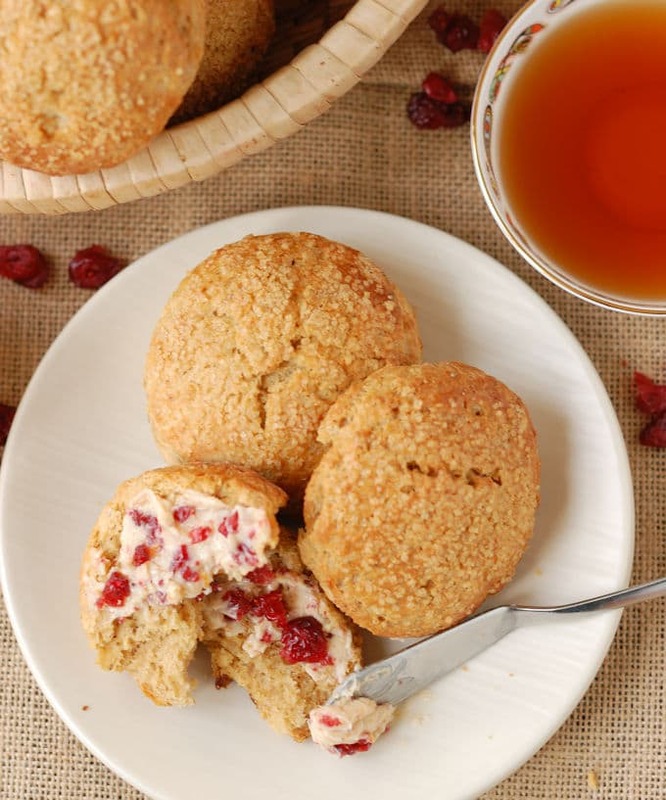 The cranberry-maple butter couldn’t be simpler. Just combine the ingredients in a mini food processor if you have one. If you don’t have a small processor mince the dried cranberries with a knife and mix the ingredients together. Oh, and yes, you must use real maple syrup. There is no substitute!! 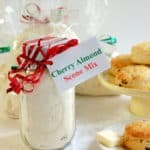 Perfect for your holiday brunch, breakfast or afternoon tea. Time to put the kettle on! 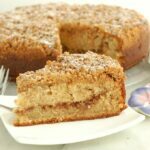 1/4 cup demerara sugar or "Sugar in the Raw"
Whisk together the eggs, buttermilk and molasses, set aside. 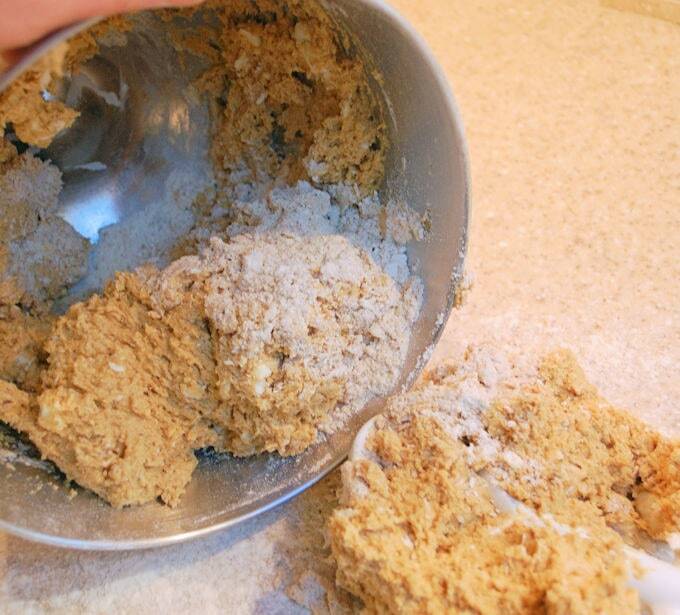 Combine flour, baking powder, spices, salt and sugar in a mixer bowl. Mix dry ingredients on low speed with the paddle attachment for 30 seconds to combine. With the mixer running, toss in the butter chunks a few at a time. Continue to mix on medium-low speed until the butter bits are the size of a pea. Mix on low until just barely combined. Some loose flour will remain at the bottom of the bowl. DON'T OVER MIX. 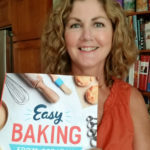 Use your hands to pat the dough until it is a 3/4" thick disc. 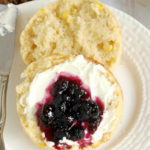 Use a 2"-3" biscuit cutter to cut scones, cut straight down, don't twist or turn the cutter. 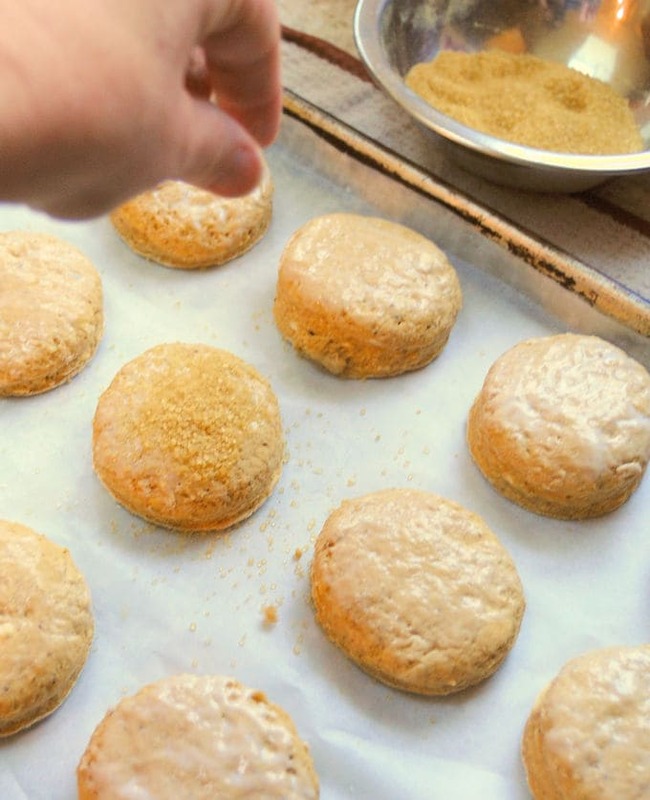 Arrange the scones on a parchment lined baking sheet, leaving at least 1/2" space between. 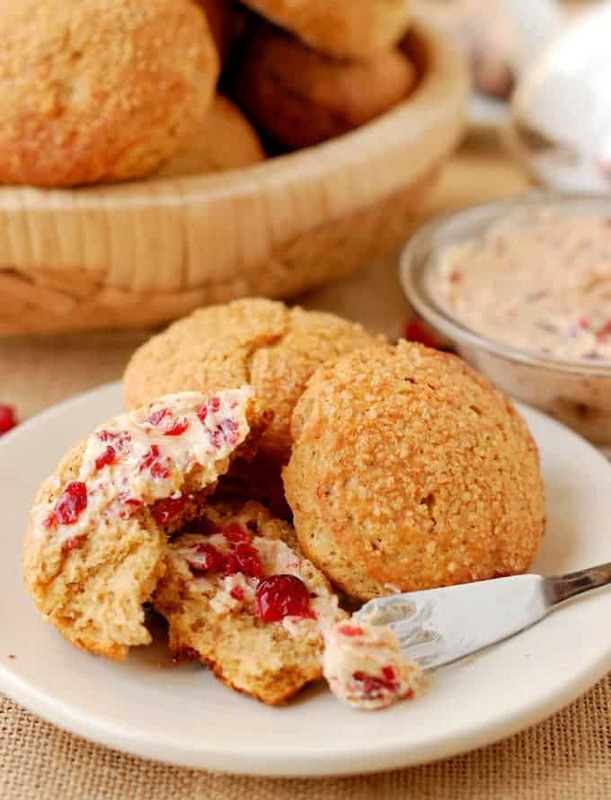 Brush the tops of the scones with buttermilk and sprinkle with ginger sugar. Bake on the middle rack of the oven, flipping the tray after 10 minutes (see note). The scones are ready when they are golden brown, feel light and sound hollow when the bottom is tapped. Total baking time about 15 minutes. Process in 30 second increments, scraping the bowl between. Process util the cranberries are chopped into small bits. When you flip the tray around after 10 minutes take a look at the bottom of a scone. If they look like they're browning too fast slide another tray under the scones until they are fully baked. 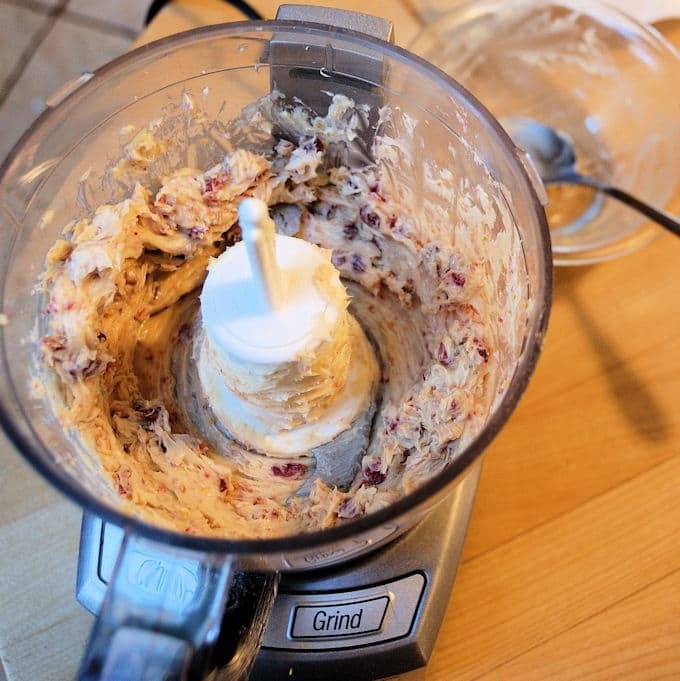 If you don't have a small food processor to make the cranberry maple butter mince the dried cranberries by hand and stir together the ingredients.